about this book: I wrote Not Quite Zen because baby boomers are a biggest demographic population. I thought it would be fun to set the book in a nursing home environment and add a little mystery of who's trying to kill the seniors at the center. 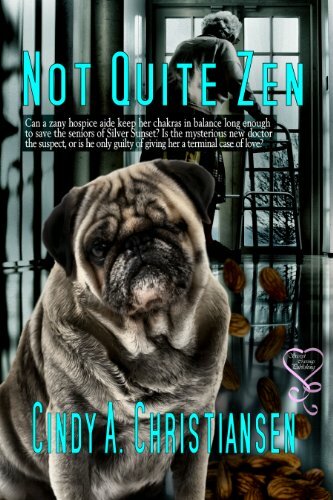 Involving a zany heroine who practices meditation and chakra therapy due to a traumatic home invasion experience as a child just adds to the fun. The six therapy dogs she's training plus her special Pug dog named Buddha adds to the fun as well. To complicate matters even more, old Doc Barlow disappears and a suspicious but good-looking doctor takes his place. No one knows he's in the witness protection program wearing a disguise. This is a great fun romp that will keep you laughing and guessing what will happen next. This book is suitable for your grandmother to your granddaughter and is a sweet romantic mystery. Sweet romance means there are no bedroom scenes or profanity. I love classic television and make references to a number of the great television classics of our past.